More road racing (and the odd bit of time trialling on the road bike, for “fun”) been going on over the last couple of weeks. First up, a 3/4 cat race up in Cumbria. Angela and I decided to turn it into a mini holiday and camped over on the Saturday night before, which gave me a chance to roll round the course the day before. Lots of nice wide roads, and a not-pan-flat profile through some stunning countryside was encouraging. The race kicked off pretty steadily. The first lap always feels a bit cagey (3/4 cat races are renowned for it…) and mid bunch wasn’t all that much fun a place to be, so on the long back straight along the A6 I worked my way up to the front and took a few turns setting the pace, just to keep out of trouble. A few people tried jumping off up the road, but never really looked like getting anywhere and we crossed the finish line for the first time all together. 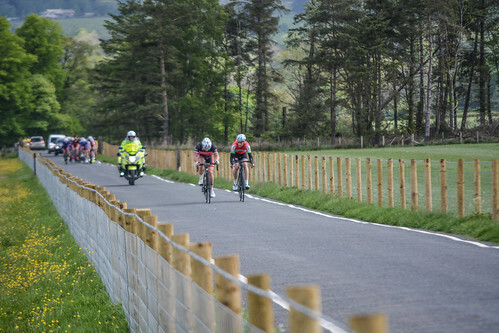 The second lap was pretty much the same, I’d not enjoyed the fast descent down to the finish in the group first time round, so as we turned left after the A6 onto another ‘lumpy’ part of the course I decided to jump onto a decent looking attack made by 3 riders. We got a small gap over the field pretty quickly but the pace needed seemed to be too much for a couple of the guys, who dropped back, leaving me and one other lad about 10 seconds ahead of the main bunch. There didn’t seem to be any organised reaction from behind so, as we crossed the finish line for the second time, a decision was made to get our heads down and see how long we could stay away for. I’m not sure either of us really expected to stay away for 30 miles (and to be honest I wasn’t even thinking about it, it just seemed more fun that all the jostling in the group had been). We worked pretty well together – I’m not suggesting it was silky smooth changeovers befitting a team time trial or anything like that, but we shared the workload and seemed to be happy pushing at our advantage at a similar pace – and over the next couple of laps we eked out our lead until we had a decent couple of minutes lead over everyone else. We could probably have started laying mind games with each other on the last lap and mucked everything up, but we carried on working together right until the final drag to the finish, where the World’s Lamest Ever Sprint took place, with me grovelling away at 13mph, only to be jumped as the yound lad hit the dizzying speed of 13.5mph and pulled ahead over the line. We’d got away, worked together well enough to get a couple of minutes on the field (and match the pace of the E/1/2/3 race for 30 miles, taking place at the same time) with just the two of us. I was happy enough with that. This time round it was a 2/3/4/ cat race, so I expected the pace to be higher as a result, but the first lap seemed about the same. If anything sitting mid bunch was worse, with more random accelerations/slowing down as we worked our way up the drag to the top of the course. The road surface was almost hilariously bad, with huge patches of deep potholes and badly worn/failed repairs making the ride pretty uncomfortable, even on the Madone. Thankfully the errant bottle didn’t get caught up in anyone’s wheel or cause a crash, but it left me in a quandry. I knew I’d suffer without anything to drink (and I still expected the speed of the race to increase as time went on) so what to do? Sit in the bunch and hope I didn’t get too thirsty before cramping up and being shot off the back of the peloton? Just sack it off now and roll back to the car? Second time round I got off the front of the race on my own for a couple of miles. I didn’t really expect to stay out there alone for long, but it was fun and got the roadside crowds (OK, 3 people stood in a layby) cheering. I was caught by another attempted break away from the main bunch and jumped on the back of it, hoping it would work, but for the rest of that lap anything that tried to get away was pretty much immediately cancelled out by reactions from the field. More attacks were made on the 3rd lap, most came to nothing but I managed to get a few seconds up the road with two other riders before anyone in the pack could react. 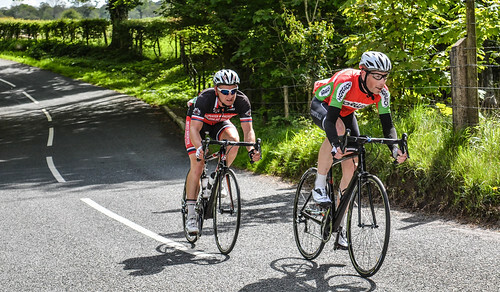 For a couple of miles we worked well enough together to open up a decent little gap, until on a 90 degree downhill corner one of us got caught out, locked up and crashed out (he got back on, got back in the main group and did alright apparently, should you be worried…). Once again I found myself off the front of the race in a two man breakaway. Which would have been ace, if it weren’t for a complete lack of anything to drink and some quite obviously faster-than-last-weeks-race riders staring up the road at us. Pic by – yep – Ellen Isherwood again! There didn’t seem to be any point in just giving up the advantage we’d worked for, plus I was still convinced I’d start cramping up and suffering from some sort of dehydration based death shortly anyway, so we got on with working together. We shared the work pretty well for a couple of laps, getting as far as about 40 seconds ahead of everyone else, taking a couple of mid race ‘primes’ into the mix and we started the last lap with about 30 seconds advantage. I was feeling pretty rotten by this point, mouth properly dry and beginning to feel the unmistakable twinges of cramp as we worked our way up the first climb. If there’d been a roadside drinks vendor touting for business I would probably have just skidded to a halt and drunk everything in sight, but there wasn’t, so I just got on with suffering as much as was possible. We were joined by a third rider who’d bridged across to us and helped inject a bit of pace into our attempt to stay away. I tried as much as possible to take my turns at the front, but started hitting my ‘red line’ each time as cramp started to limit what power I could put down. I missed a few turns, still going to the front every now and again but immediately noticing that I wasn’t pulling us along at the same speed as the other two. With only a mile or so to go to the line, more escapees from what was left of the peloton (which had, apparently, broken up a bit under the pressure of the speed of the race) bridged over to us and by the final descent my thoughts had gone from staying away to staying in the top 10. Sadly that didn’t happen as some hard braking to avoid a rider who cut across me on the final descent saw me lose all my momentum and have to basically set off from scratch in top gear up a hill on cramping legs.